Chronic back pain is hard to diagnose and treat. There are many, many variables to consider. However, one that is commonly overlooked is inflammatory causes of back pain. BJC Health specialises in inflammatory conditions, such as rheumatoid arthritis and Ankylosing Spondylitis and has put together this guide to help educate the community on this condition. Ankylosing Spondylitis (AS) is an inflammatory rheumatic condition that is one of a number of diseases that are characterised by inflammation of the spine termed Spondyloarthritis. The inflammation that occurs particularly affects the sites at which tendons or ligaments join onto bone. The most commonly affected region is the sacroiliac joints, which is where the spine joins onto the pelvis. However, any joint can be affected. What are the signs and symptoms of Ankylosing Spondylitis? How do we treat Ankylosing Spondylitis? 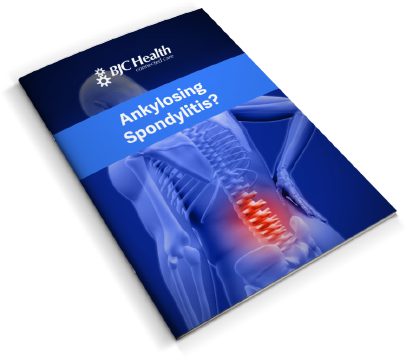 At BJC Health we specialise in Ankylosing Spondylitis. This guide was created with the help of the integrated BJC Health team. The text was provided by Dr Roberto Russo with contributions from Dr Herman Lau, Ms Rachel Butterworth and Mr Errol Lim. Dr Irwin Lim was responsible for the layout and format of this publication. Many practices consist simply of individual practitioners in a common office. BJC Health is different – our specialists and allied health professionals work together to ensure that your diagnosis is thorough and that related conditions are also looked after. An in-house administration team also means that it’s easy to talk to us and ensures information about your progress is well kept, even across sites. We call this holistic approach, Connected Care. Whether you are referred to our specialists by a GP or you meet our allied health professionals via a walk-in visit, we’ll coordinate our expertise to offer the care most relevant to you.